Okay, I admit it; I teared up. A little. 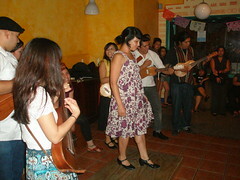 Last night was the goodbye party for Antigua Cultural Coffeehouse in El Sereno,my little local coffeeshop just a short walk away from my house. Truth be told, one of the reasons we even made an offer on this house was because of the coffeeshop. We got used to living within walking distance of a coffeeshop when we lived in Hollywood, so it made sense. 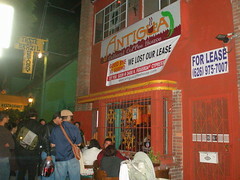 But Antigua lost its lease due to what sounds like shady shenanigans by the property owner. When we arrived around 8pm, the place was packed. Julio and his wife Cuauhtli were behind the counter serving up coffee. The until-recently-off-limits patio was open in the back where alcoholic drinks were sold. It was jarring to see the murals and signs removed, along with the counter and the bookshelves. It it hit me that I really have no place to take my kids in the morning any more. I’ll no longer will be able to hop over to Antiqua to talk politics with Cuauhtli, Yancy and some of the regulars. The sense of community was strong. I spoke to people from all over Southern California; a guy from Irvine, a lady from the westside who works downtown and goes to Antigua every morning, a lady from Wildomar and of course, the locals. Las Cafeteras came down the street and performed. Councilman Jose Huizar made an appearance after the El Sereno Firework show and I saw, most likely for the last time, faces that have become familiar to me over the last year and a half. While the Yancy and Cuauhtli will no longer be working together, Yancy and his wife, now have a new shop in Cypress Park on 3400 N. Figueroa St. where you can still get coffee made from some of the best beans around. For more photos, you can see my flickr set. That’s sad. I loved that coffeehouse. I don’t understand why everything in LA that’s interesting get’s killed so quickly. Good thing they got another place in Cypress Park though, but El Sereno really needed that homegrown coffee house. speaking of things we are admitting – I’ve lived in El Sereno for a year, half a mile from this place – and never visited! I called on Thursday to ask when their last day was and when Saturday rolled around, I didn’t remember until it was too late. I can’t believe I never went. I’m really kicking myself. Truth be told, the only place I ever really go in the neighborhood is Hecho en Mexico. I’ll have to check out the Brazilian place that’s next to Antigua…I hope that’s not leaving anytime soon. I love Brazilian food! @alaiaw: The Brazilian place is okay. There is better Brazilian food to be found around LA, but for a city where you can get seemingly only get Mexican, Guatemalan or El Salvadorean food, this is a nice change of pace.